Climate risks, food insecurity and metastasizing violence are all set to intensify in the west African Sahel. Climate change is partly to blame. The United Nations estimates that roughly 80% of the Sahel's farmland is degraded. Temperatures there are rising 1.5 times faster than the global average. As a result, droughts and floods are growing longer and more frequent, undermining food production. 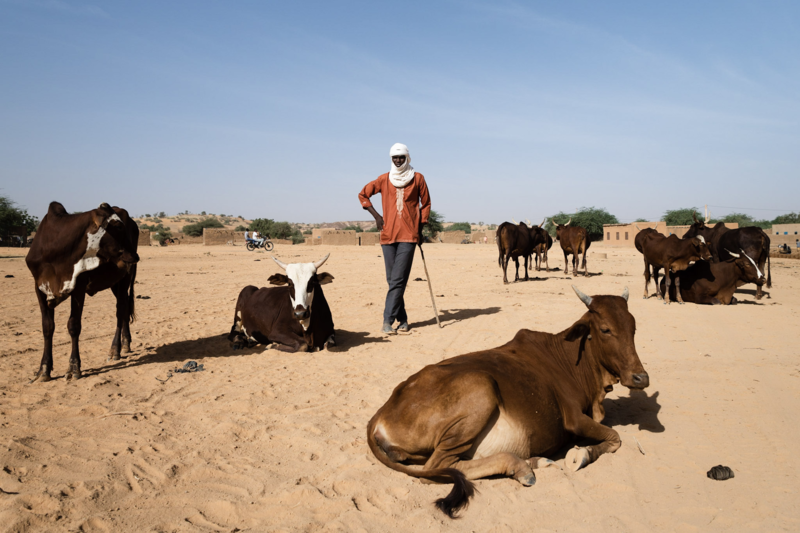 About 50 million people in the Sahel depend on livestock rearing for survival. But the land available to pastoralists is shrinking. This is aggravated by surging population growth that is pushing farmers northward to cultivate more crops. And while adverse climate conditions are sparking violence, proliferating jihadi insurgencies are also creating no-go areas, turning a bad situation even worse. The region’s violent conflicts are contagious. One reason for this is that national borders are porous and largely unguarded. Instead, they are criss-crossed with enterprising merchants and cattle herders, together with sinister extremist and criminal networks trafficking in toxic ideologies, drugs and weapons. Insurgencies in one country can and often do spill across borders, as was the case when conflict spread from northern to central Mali and into north and eastern Burkina Faso and southwestern Niger. Manipulated by government and business elites, marginalized pastoralists serve as the footsoldiers of the Sahel's interlocking conflicts. They are ready recruits precisely because of diminished livelihood options and social exclusion. The warning signs are flashing red after a combination of poor rainfall, livestock losses and pasture shortages contributed to historic food insecurity in 2018. At least 6 million people in Burkina Faso, Chad, Mali, Mauritania, Niger and Senegal required urgent food assistance at the end of last year. Another 8 million more people are currently receiving relief aid in Nigeria's middle belt provinces of Borno, Adamawa and Yobe and the Lake Chad basin. 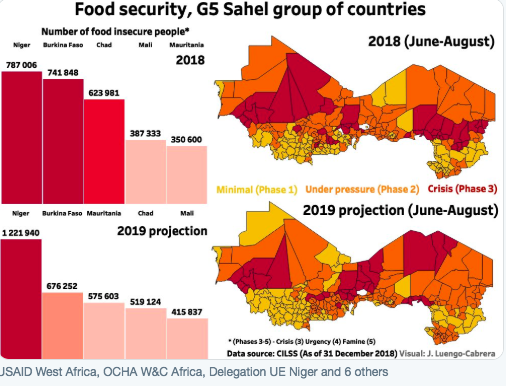 The Permanent Interstate Committee for Drought Control in the Sahel is anticipating what it describes as "persistent food insecurity" for the foreseeable future. The combination of poor governance, languishing economies, depreciating local currencies, inflation, spiking migration and transhumance and violence are a volatile mix. Niger registered a tripling of protests and riots and rising border violence in 2018. A new tax law and the spiraling cost of living sparked waves of unrest. According to ACLED, some 30 mass protests occurred in 2018, compared to just 11 in 2017. Roughly 60% of these events were concentrated in Niger's capital, Niamey. Inter-communal violence is also on the rise, including in western Niger on the border of Burkina Faso and Mali. More than 52,000 people were displaced in 2018 alone (added to the estimated 144,000 who are already displaced). Making matters worse, the number of people who are food insecure is expected to rise by over 55% this year, from 787,000 in 2018 to 1,221,000 in 2019. Meanwhile, Nigeria's middle belt is on fire. Farmer-herder violence is now far deadlier than the havoc wreaked by Boko Haram. ACLED has documented violent escalation in Benue, Plateau, Taraba and Nasawara – with fluctuations aligned with dry and raining season – as well as with electoral cycles. Violent disputes involving herder militia are due to an interplay of factors, including control over grazing areas, disputes over land, manipulation by elites and extremism. In a worrying sign, Fulani herdsman are increasingly confronting government forces (e.g. including, most recently, during military-led Operation Cat Race and Operation Whirl Stroke). Finally, the region's governments, businesses and civil societies would benefit from expanded investment in platforms that forecast political violence, food crises and climate stress. Those that already exist – including the World Bank's Famine Action Mechanism, the UN's Early Action System, the ACLED violence monitoring datasets, and Uppsala's Violence Early Warning System (VIEWS) – could use an additional injection of resources. It is equally important that public and private leaders and civil societies recognize and anticipate ways that agriculture and livestock production are likely going to change in relation to climate, and encourage investments in adaptation and new crops in advance to avoid major declines in crop yields. The future looks challenging, which makes it all the more important to prepare for it.